Instead, it’s cultural: “Letting your parents live in an old-folks home is unthinkable where I come from,” she says, referring to her Indian-Iranian background. Although she doesn’t expect her parents to downsize for quite some time (she’s in her 30s, they’re in their 60s), the eventual move was of primary consideration when she started renovating her Toronto semi a few years ago. She worked with award-winning architecture firm Williamson Chong to contemporize the 2,760-square-foot Victorian to her taste – it’s all crisp lines and fluid spaces. But the floor plan accounts for the fact that, one day, her parents won’t want to live independently any more, and will want to be closer to their grandchildren (much like many people in their demographic – according to Statistics Canada, the number of grandparents living with the grandchildren jumped 45 per cent between 2001 and 2011). Right next to the dining area, there’s a secret passageway. It’s concealed by a wood panel and tucked behind a cubby that’s used to store the kids’ craft supplies. In the future, the cubby will be removed and the panel turned into a door for Ratna and Mehran’s basement apartment. (The conversion should take less than a weekend.) The 1,020-square-foot suite will allow for both independence – it has its own kitchen and eating area – as well as togetherness, with easy access to the house’s main living spaces. Until then, the suite has a separate, exterior entrance and is being used as a rental apartment. Architect Betsy Williamson, one of the partners at Williamson Chong, explains that, in order to make a multigenerational house successful – where all ages feel accommodated, not cramped – it’s essential to factor in everyone’s needs and expectations from the outset of the design (“it would be impossible to do this right as an afterthought,” she says), and to listen carefully to the family’s particular set of cultural and demographic requirements. The Omidvar project was the first multigenerational home her firm has completed, and Williamson has two more on the boards, a sign of the growing trend. Each has its own requirements. For example, whereas Ramona’s parents don’t foresee an issue navigating stairs, mobility is more central to a house Williamson is designing for a family in the Ancaster community of Hamilton. The grandparents have their own entrance to a suite on the ground floor, where all the rooms, including the master bathroom, are sized to accommodate wheelchairs. A ground-floor guest bedroom can be converted for a live-in nurse. Extra sound attenuation in the walls will provide privacy for when the parents want to have friends over, and the grandparents want to rest. Henri Cleinge is a Montreal-based, modern-minimalist architect. He agrees that each multigenerational home has to be custom-tailored for the owner’s specific needs. In 2012, he finished constructing his first such place in Dorval, Que. The clients were two Vietnamese-Canadian doctors with two young kids and one set of grandparents. They wanted a house where their children would always be under someone’s watchful eye. Bryn Davidson, a Vancouver-based engineer and architectural designer, understands how multigenerational living arrangements can be mutually beneficial. Under the moniker Lanefab, he started creating small, laneway homes in 2009, when the City of Vancouver introduced a bylaw allowing backyard dwellings. Many of the ones he’s built since then have been to accommodate adult children moving back in with their parents (the rest have been for rental income). “Laneway housing is a nicer version of a basement suite,” he explains. “And they allow people to age in place … people who have owned their homes for a long time have seen their property value increase tremendously, but they don’t necessarily have the income to afford the increased property taxes.” Cost-sharing with the kids is one solution, an especially appealing one if the younger generation is drowning in mortgage debt in a tiny condo. A laneway house costs “hundreds of thousands of dollars” less than an apartment, according to Davidson, because the land tends to be paid for. He points to two clients who recently sold their Burnaby, B.C., condo to move into their parents’ backyard. With the money they saved by co-sharing, they invested in top-quality appliances, solar panels and a garden-view Jacuzzi off their open kitchen. As their family grows, they might one day swap dwellings with their parents – giving the grandparents unlimited access to the Jacuzzi for their twilight years. This piece originally appeared in the Globe and Mail on Thursday, March 13, 2014. 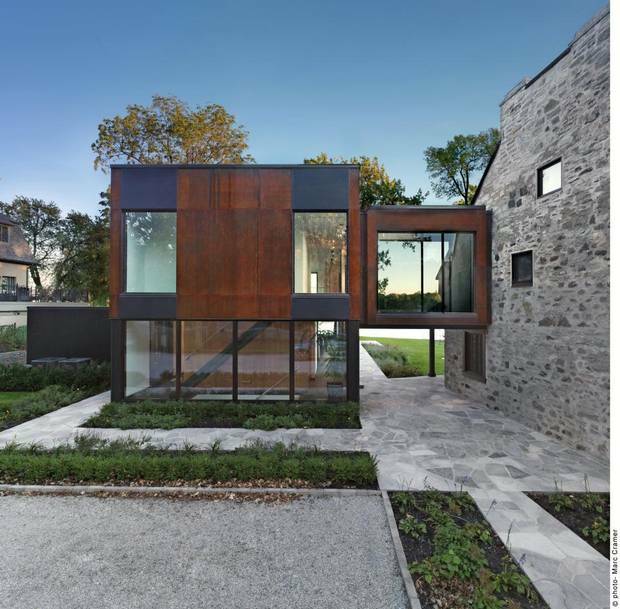 This entry was posted in Design Spy and tagged Architecture, Canadian Design, Globe and Mail, Henrie Cleigne, Lanefab, Montreal, Toronto, Vancouver, Williamson Chong by mmhague. Bookmark the permalink.